I am pleased to share this free pattern with you; this doily was named for my mother, Mavanee Joann, who loved roses and taught me how to crochet. I hope you will enjoy it! Rnd 6: Ch 1, (sc, ch 1, 3 dc, tr, 3 dc, ch 1, sc) in each ch-4 sp around, join with sl st in first sc. Fasten off. Rnd 8: Ch 1, (sc, ch 3, 2 dc) 4 times in each ch-10 sp around, join with sl st in first sc. Fasten off. Rnd 10: Sl st to center of first ch-5 sp, (ch 1, sc) in first ch-5 sp, ch 6, (sc in next ch-5 sp, ch 6) around, join with sl st in first sc. Rnds 11 & 12: Sl st to center of first ch-6 sp, (ch 1, sc) in first ch-6 sp, ch 6, (sc in next ch-6 sp, ch 6) around, join with sl st in first sc. At end of last rnd, fasten off. Rnd 13: Join green with sc in first ch-6 sp, (6 dc, ch 2, 6 dc) in next ch-6 sp, *sc in next ch-6 sp, (6 dc, ch 2, 6 dc) in next ch-6 sp; repeat from * around, join with sl st in first sc. Fasten off. Rnd 14: Join brown with sl st in first ch-2 sp, ch 4 (counts as first dc and ch-1 sp), (3 dc, ch 1, dc) in same ch-2 sp as joining, ch 9, *(dc, ch 1, 3 dc, ch 1, dc) in next ch-2 sp, ch 9; repeat from * around, join with sl st in 3rd ch of first ch-4. Rnd 15: Ch 4 (counts as first dc and ch-1 sp), 3 dc in first ch-1 sp, ch 1, 3 dc in next ch-1 sp, ch 1, dc in next dc, ch 4, sc in next ch-9 sp, ch 4, *dc in next dc, ch 1, (3 dc in next ch-1 sp, ch 1) 2 times, dc in next dc, ch 4, sc in next ch-9 sp, ch 4; repeat from * around, join with sl st in 3rd ch of first ch-4. Rnd 16: Ch 4, (3 dc in next ch-1 sp, ch 1) 3 times, dc in next dc, ch 4, skip next 2 ch-4 sps, *dc in next dc, ch 1, (3 dc in next ch-1 sp, ch 1) 3 times, dc in next dc, ch 4, skip next 2 ch-4 sps; repeat from * around, join with sl st in 3rd ch of first ch-4. Rnd 17: Ch 4, (3 dc in next ch-1 sp, ch 1) 4 times, dc in next dc, ch 3, skip next ch-4 sp, *dc in next dc, ch 1, (3 dc in next ch-1 sp, ch 1) 4 times, dc in next dc, ch 3, skip next ch-4 sp; repeat from * around, join with sl st in 3rd ch of first ch-4. NOTE ON JOINING THE NEXT 3 RNDS: At the end of Rnd 18, you will join by working a hdc into the top of the first ch-3 of the round; this will create the last ch-2 sp of the round. You will work into this sp by inserting your hook around the post of the hdc. In Rnds 19 and 20, you will join with a sc in the top of the first ch-3 to create the last ch-1 sp of the round. You will work into this sp by inserting your hook around the sc st.
Rnd 18: Sl st into first ch-1 sp, (ch 3, 2 dc) in first ch-1 sp, (ch 1, 3 dc in next ch-1 sp) 4 times, ch 2, skip next ch-3 sp, *3 dc in next ch-1 sp, (ch 1, 3 dc in next ch-1 sp) 4 times, ch 2, skip next ch-3 sp; repeat from * 10 more times, 3 dc in next ch-1 sp, (ch 1, 3 dc in next ch-1 sp) 4 times, join with hdc in top of first ch-3 to form ch-2 sp. Rnd 19: (Ch 3, 2 dc) in first ch-2 sp, (ch 1, 3 dc in next ch-1 sp) 2 times, *ch 5, 3 dc in next ch-1 sp, ch 1, 3 dc in next ch-1 sp, ch 1, 3 dc in next ch-2 sp, (ch 1, 3 dc in next ch-1 sp) 2 times; repeat from * 10 more times, ch 5, 3 dc in next ch-1 sp, ch 1, 3 dc in next ch-1 sp, join with sc in top of ch-3 to form ch-1 sp. Rnd 20: (Ch 3, 2 dc) in first ch-1 sp, (ch 1, 3 dc in next ch-1 sp) 2 times, *ch 5, dc in next ch-5 sp, ch 5, 3 dc in next ch-1 sp, (ch 1, 3 dc in next ch-1 sp) 3 times; repeat from * 10 more times, ch 5, dc in next ch-5 sp, ch 5, 3 dc in next ch-1 sp, join with sc in top of ch-3 to form ch-1 sp. Rnd 21: (Ch 3, 2 dc) in first ch-1 sp, (ch 1, 3 dc in next ch-1 sp) 2 times, ch 5, skip next ch-5 sp, (dc, ch 5, dc) in next dc, ch 5, skip next ch-5 sp, *3 dc in next ch-1 sp, (ch 1, 3 dc in next ch-1 sp) 2 times, ch 5, skip next ch-5 sp, (dc, ch 5, dc) in next dc, ch 5, skip next ch-5 sp; repeat from * around, join with sl st in top of ch-3. Rnd 22: Sl st across into first ch-1 sp, (ch 3, 2 dc) in first ch-1 sp, ch 1, 3 dc in next ch-1 sp, ch 5, skip next ch-5 sp, 15 dc in next ch-5 sp, ch 5, skip next ch-5 sp, *3 dc in next ch-1 sp, ch 1, 3 dc in next ch-1 sp, ch 5, skip next ch-5 sp, 15 dc in next ch-5 sp, ch 5, skip next ch-5 sp; repeat from * around, join with sl st in top of ch-3. Rnd 23: Sl st across into first ch-1 sp, (ch 3, 2 dc) in first ch-1 sp, ch 5, skip next ch-5 sp, dc in first dc of next 15-dc group, (ch 2, skip next dc, dc in next dc) 7 times, ch 5, skip next ch-5 sp, *3 dc in next ch-1 sp, ch 5, skip next ch-5 sp, dc in first dc of next 15-dc group, (ch 2, skip next dc, dc in next dc) 7 times, ch 5, skip next ch-5 sp; repeat from * around, join with sl st in top of ch-3. Rnd 24: (Sl st, ch 1, sc) in next st (the center dc of the first 3-dc group), ch 5, skip first ch-5 sp, 3 dc cluster (see Special Stitches) in next ch-2 sp, (ch 3, 3 dc cluster in next ch-2 sp) 6 times, ch 5, *sc in center dc of next 3-dc group, ch 5, skip next ch-5 sp, 3 dc cluster in next ch-2 sp, (ch 3, 3 dc cluster in next ch-2 sp) 6 times, ch 5; repeat from * around, join with sl st in first sc. Fasten off. Rnd 25: Join green with sc in first sc, ch 3, (sc, ch 3, 2 dc) in next ch-5 sp, (sc, ch 3, 2 dc) in each of next 6 ch-2 sps, sc in next ch-5 sp, ch 3, *sc in next sc, ch 3, (sc, ch 3, 2 dc) in next ch-5 sp, (sc, ch 3, 2 dc) in each of next 6 ch-3 sps, sc in next ch-5 sp, ch 3; repeat from * around, join with sl st in first sc. Fasten off. Roll petals to form Rose. With green, for first leaf, ch 4, [3 dc cluster -see Special Stitches-in 4th ch from hook, ch 3, sl st in 3rd ch from hook (tip of leaf made), ch 3, sl st same ch last 3-dc cl was worked in], ch 6; for second leaf, repeat between [ ]; fasten off. 2: Glue base of rolled petals on each Rose to hold shape. Allow to dry. 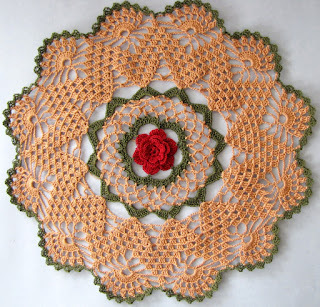 3: Place Leaves and Roses evenly spaced around doily (see photo.) Glue in place and allow to dry. Special thanks go to Diana Mitchell and Jewel Fernley for testing this pattern. So beautiful as all your patterns! Thank you so much for sharing your beautiful patterns. You have such great talent and have worked so hard. Your generosity is much appreciated. And this will make a beautiful summer project. 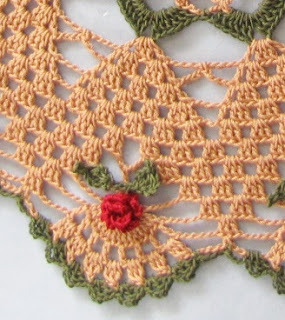 Hi thank you for sharing the pattern with us. I really appreciate the time it must take you . I certainly will give it a go . 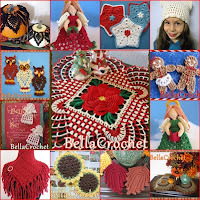 stunning design...i have been crocheting since my teens and now well into late fifties,but i have never seen simply superb pattern as this. 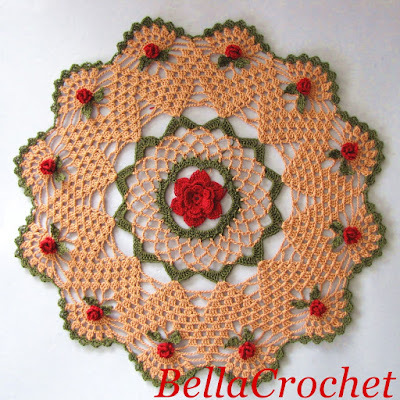 awesome pattern i wil try this insha allah.. Thank you so much for sharing,you are so talented.I love all your paterns. Each one is beautiful.